If you would like to read my Basic VMware articles, they are listed at the end of this article for your convenience. After a recent power outage this was the display on the console of the vSphere Data Protection 5.5 appliance! At first glance, it is clear that the Linux operating system has become corrupted and the Appliance is refusing to BOOT, hence the virtual machine is trying to BOOT from the network. Investigate and repair the vSphere Data Protection 5.5 appliance. 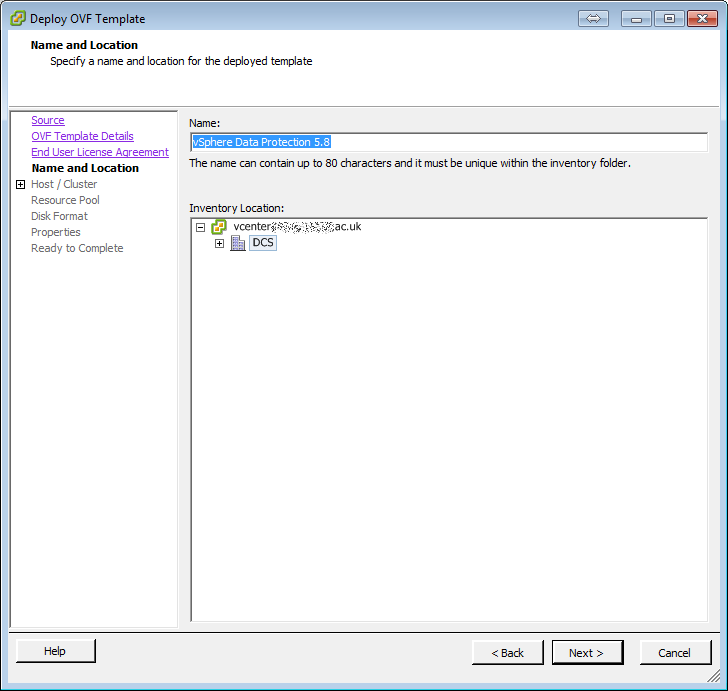 Deploy a new vSphere Data Protection 5.8 appliance and attach and Import the repository disks (the VM backups). 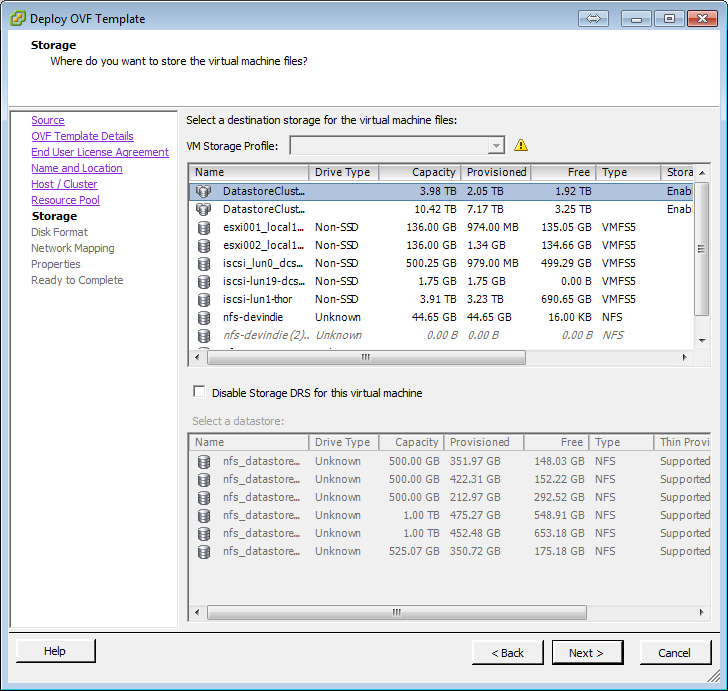 In this tutorial article I'm going to opt for Option B, and show you HOW TO: Fix a broken VMware vSphere Data Protection (VDP) Appliance, by deploying a new vSphere Data Protection 5.8 appliance and Attaching and Importing the repository disks (the VM backups).​ My work colleague has decided it will be faster for Option A! - (Check back later for the outcome!). The original version we were using was vSphere Data Protection 5.5, it is a good opportunity to upgrade to 5.8 that contains many bug fixes and improvements. We had checked previously that VDP 5.8 was backward compatible with the VDP 5.5 repository, so we downloaded the VMware vSphere Data Protection Appliance 5.8 OVA from VMware and Deploy the OVA. Ignore the EMC Corporation (Invalid certificate warning! ), check the details in the Summary, and click Next to continue. 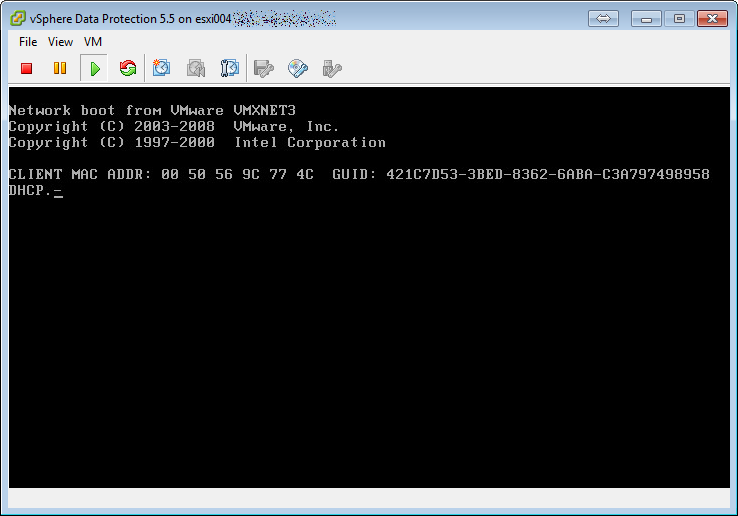 Accept the terms of the VMware End User License Agreement (EULA), and click Next to continue. 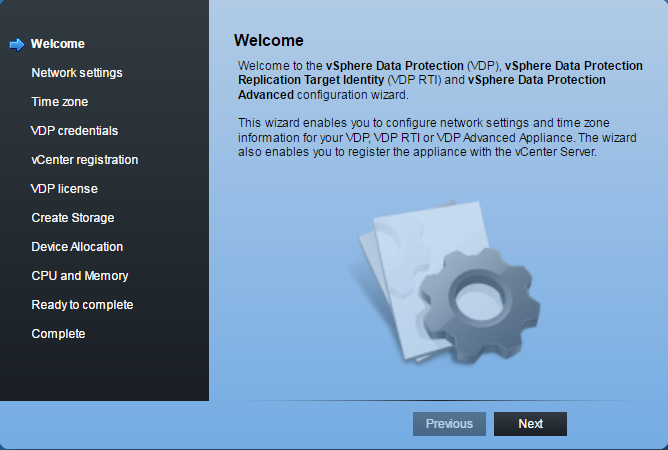 Enter the Name for the Data Protection Appliance, we usually leave as the Default - vSphere Data Protection 5.8. 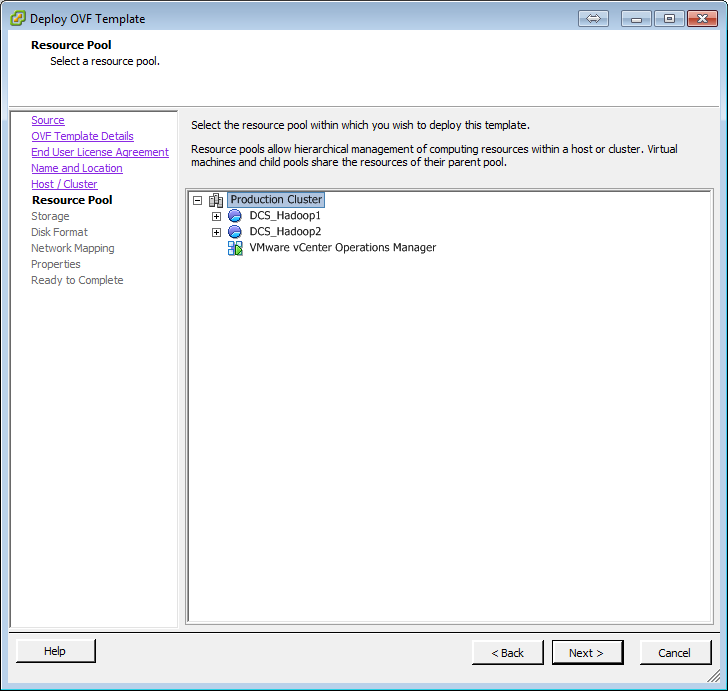 Select the Cluster for the vSphere Data Protection resource. Select the Resource Pool for the vSphere Data Protection 5.8 appliance. 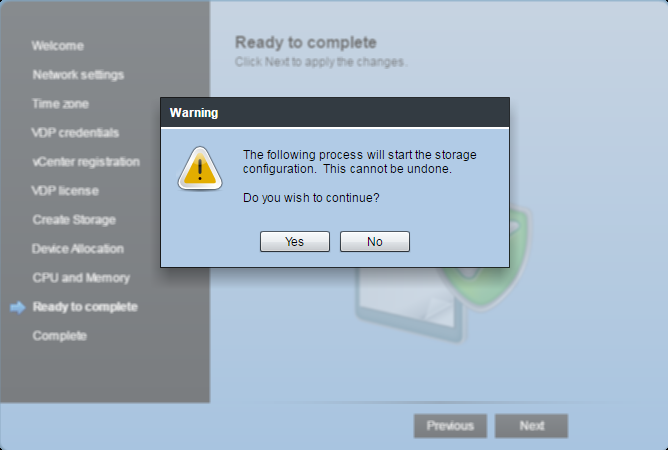 Select the Storage datastore for the vSphere Data Protecxtion 5.8 appliance. 100GB of datastore is required for a thick deployment (highly recommended!). For additional performance, I highly recommend a Thick Provisioned Eager Zeroed Disk. (This may take some additional time to provision). 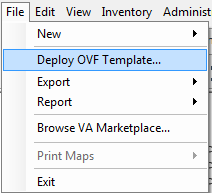 Select your Production Network (the same network to which vCenter Server and your Active Directory Domain Controllers are also connected). Enter Networking Properties for the vSphere Data Protection 5.8 appliance. These should be the same as the failed appliance. I also recommend the use of STATIC IP Address not DHCP. Do not forget to use a comma (,), in between DNS servers. 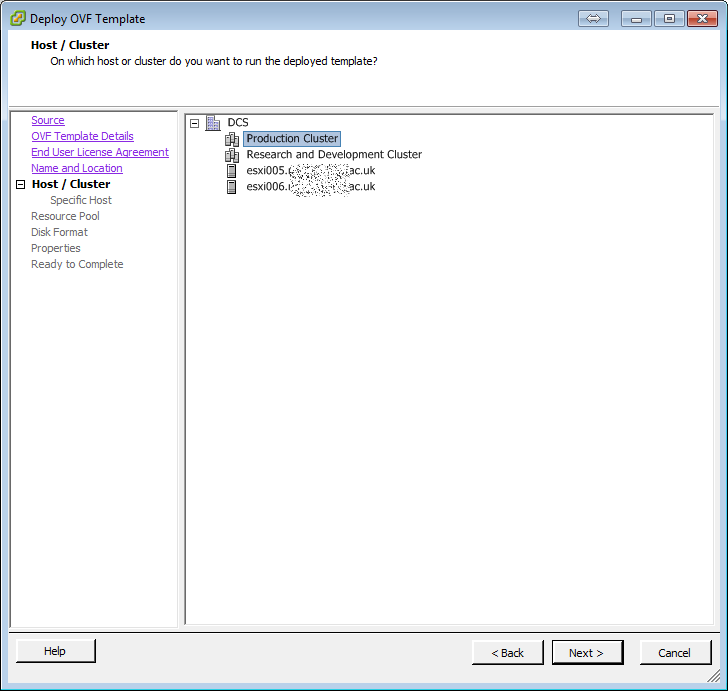 Click Next to continue and Finish to start the deployment. Select the vSphere Data Protection 5.8 appliance in the vSphere Client or vSphere Web Client. The vSphere Data Protection 5.8 appliance has been successfully deployed and started. Open a browser to the IP Address as specified on the console. Ignore any certificate warning messages. Login with the default username of root, and password changeme. At the Welcome Wizard, click Next to continue. 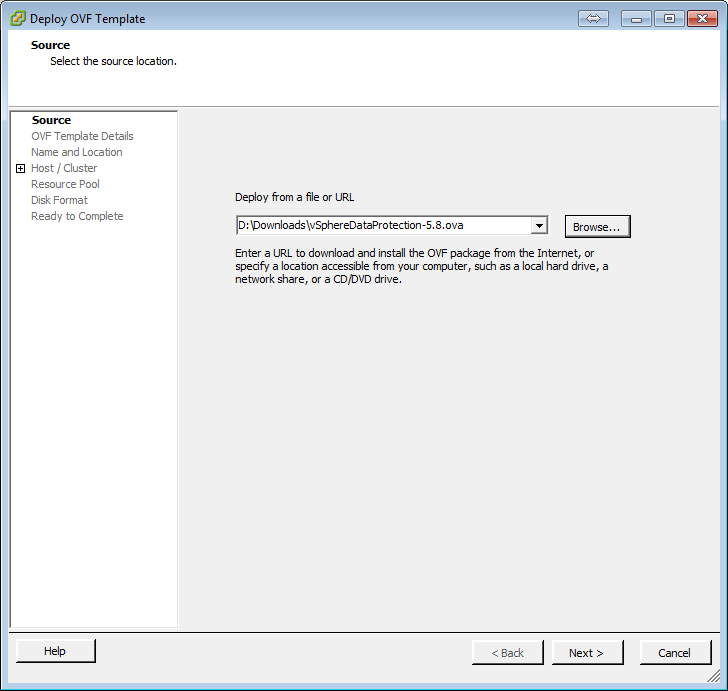 Enter Network Settings for the vSphere Data Protection 5.8 Appliance. It is recommended to use a STATIC IP Address, and not a dynamic IP Address issued by a DHCP server. We are repairing a vSphere Data Protection 5.5 Appliance, so in this tutorial we are using the same IP Address applied to the broken vSphere Data Protection 5.5 Appliance. Select a Time zone the vSphere Data Protection 5.8 Appliance is located in. This should be the same Time zone as the vCenter Server. Click Next to continue. Change the password to the VDP appliance, checking that it matches the password criteria. Click Next to continue. 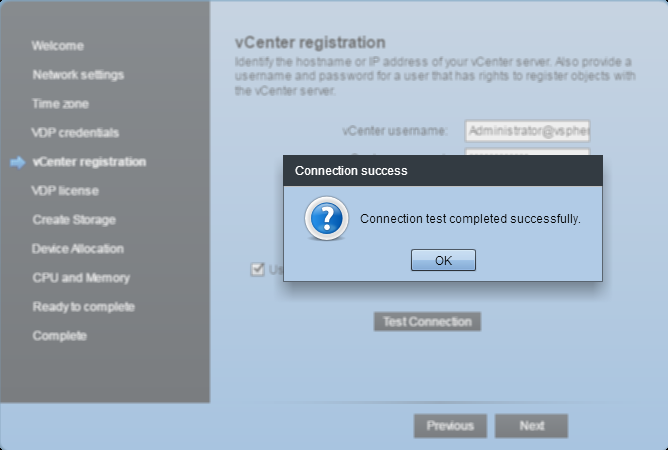 Enter the vCenter username and password, and the vCenter Server IP Address or Host Name, and Click Test Connection. We recommend the SSO username Administrator@vSphere.local account. This is used to register the appliance with vCenter Server. You did remember your SSO Administrator password! The VDP appliance we are replacing was a standard VDP appliance. If you are deploying or replacing a VDP Advanced applaince, select VDP Advanced and enter your License Key. Click Next to continue. 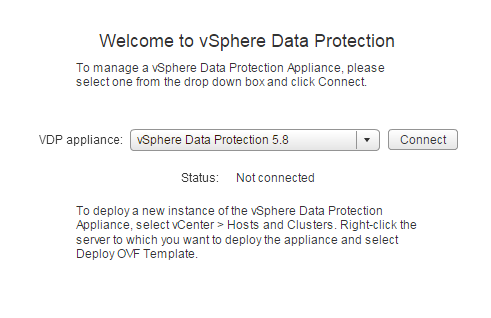 Up until this step, we have been deploying a new vSphere Data Protection 5.8 Appliance. If you want to create a new standalone vSphere Data Protection 5.8 Appliance, select Create new storage, and select the capacity, 0.5, 1.0 or 2.0TB. We want to recover our vSphere Data Protection 5.5 Appliance backups, so we will be selecting Attach existing VDP storage. Click Next to continue. Browse to the location of the existing vSphere Data Protection 5.5 Appliance repository storage. Click Next to continue. Select and add all the disks to the appliance. Click Next to continue. The disks will be verified, imported and attached to the appliance. Click Next to continue. Review the minimum CPU and memory requirements for this capacity, we use a 2.0 TB appliance, and our tests have shown, that 4 vCPU and a memory of 16GB is suitable. Click Next to continue. Click Yes to continue to Import the storage. 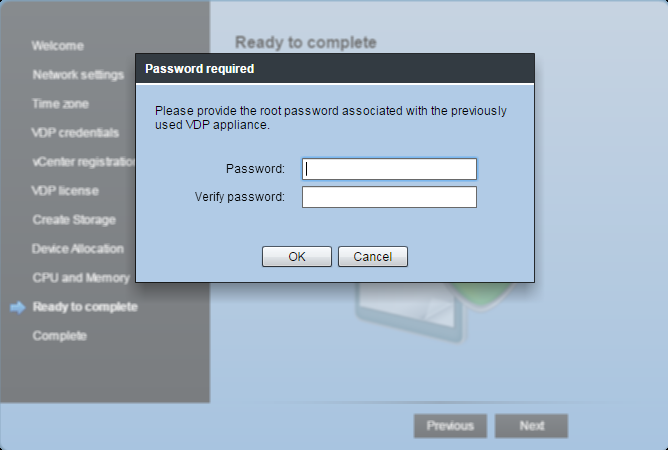 Enter the username and password for the old vSphere Data Protection 5.5 Appliance. 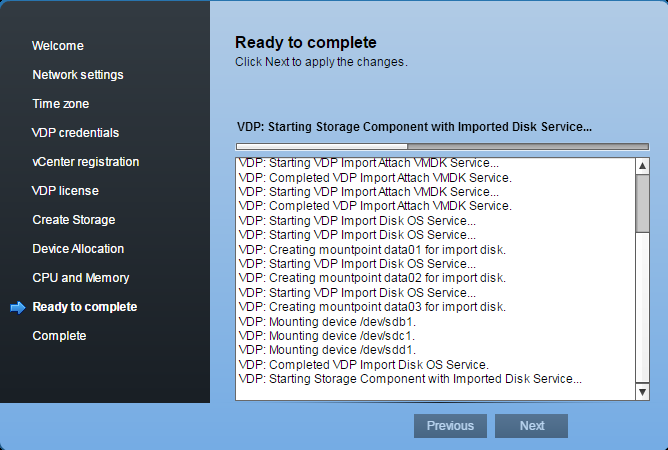 The VDP appliance services are started and the disks are mounted and backups imported into the Restore Job list. Select Restart Now to restart the Appliance. 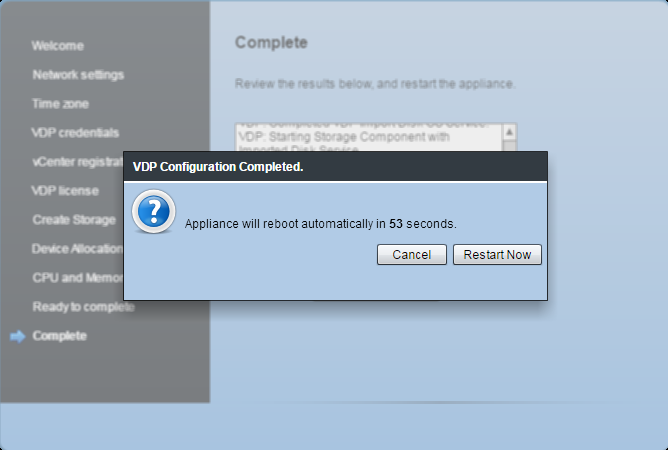 It takes a few minutes for the VDP appliance to become ready as it configures itself. Time to grab a coffee; all the hard work has been completed. When the appliance is ready and the blue console appears, login via the Web Client. A quick method to estbalish the backup repository has been imported successfully is to start the Web Client and select the Restore option. 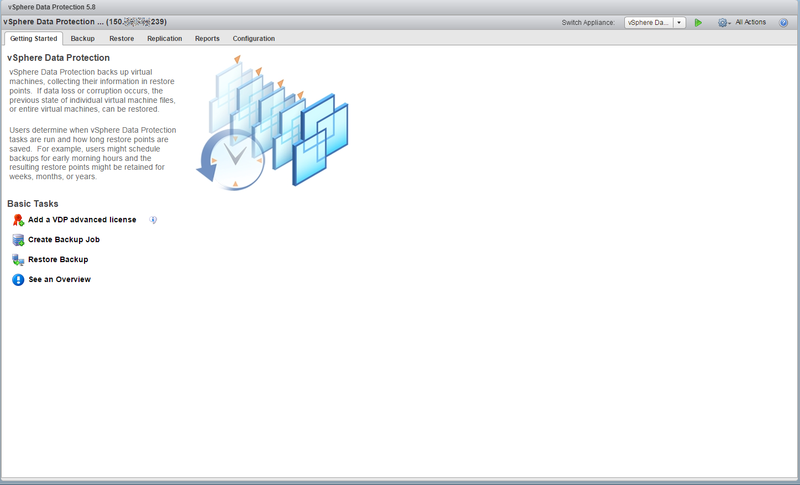 Selection vSphere Data Protection, in the left hand window. 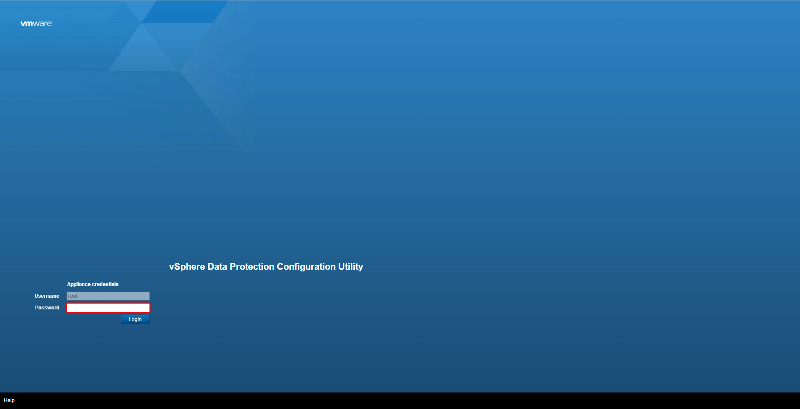 Click Connect to connect to the vSphere Data Protection 5.8 appliance. The imported backups from the old vSphere Data Protection 5.5 appliance are located in REPLICATE folder. Select the REPLICATE folder, and all your old backups with the previous vSphere Data Protection 5.5 appliance, will be available to restore. It took me less than 30 minutes, to Import the VMware vSphere Data Protection 5.8 (VDP) Appliance, attach and import the disks, wait for the configuration before I was able to start Restores! 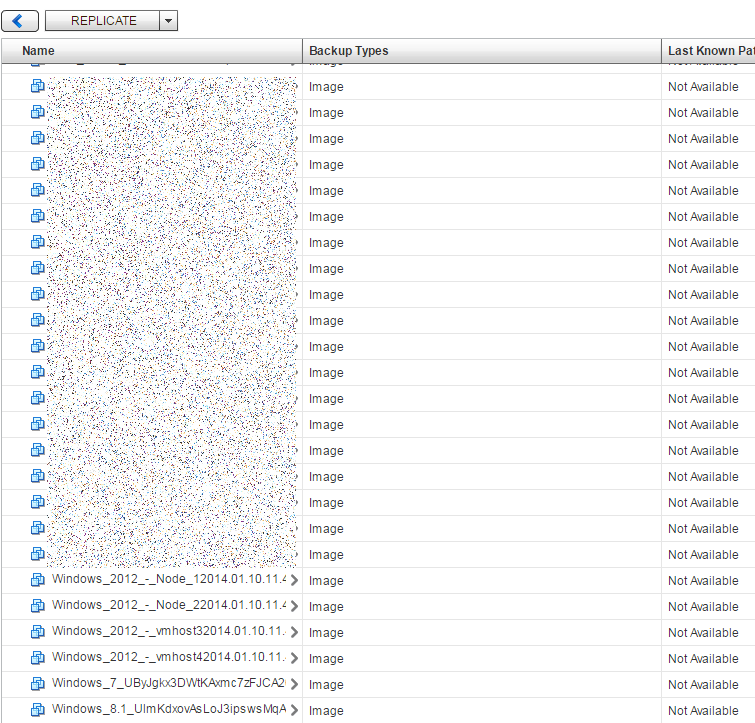 You would still need to setup Backup Jobs and complete email notifications for full recovery. During this series of articles VMware released VMware vSphere 5.5 and VMware vSphere Hypervisor ESXi 5.5. 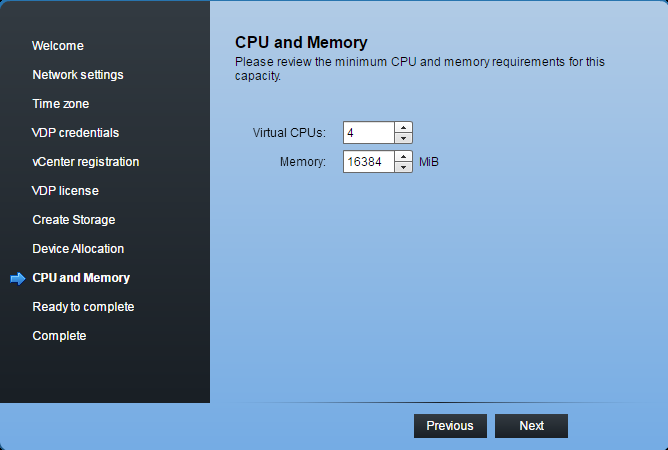 These articles are also applicable to VMware vSphere Hypervisor ESXi 5.0 and 5.5. For consistency, I have used VMware vSphere Hypervisor ESXi 5.1 throughout this series.